The plugin requires you to have Elementor plugin installed and activated on your site. 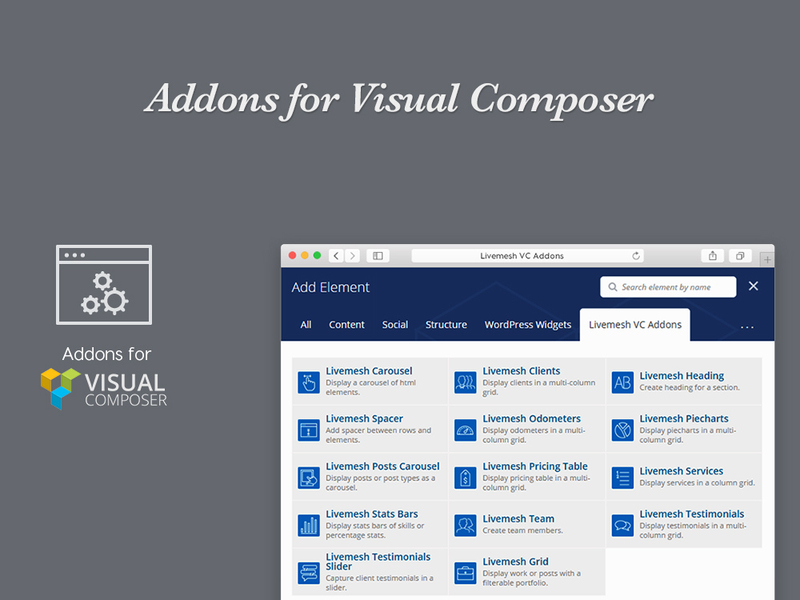 A large collection of Premium addons for Elementor. Building a beautiful website is as easy as drag and drop. All the great features and addons you need to get started on creating a beautiful website. More features and additional addons to build a professional website without switching your WP theme. 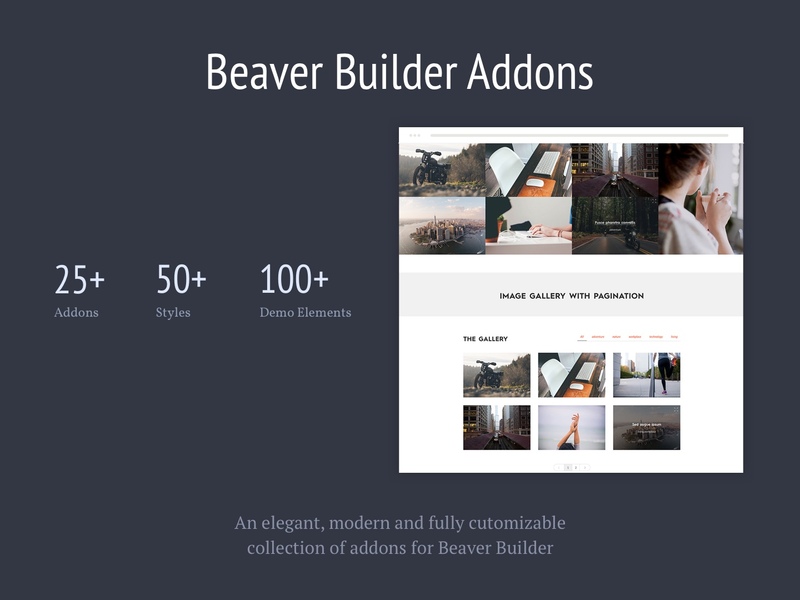 Exquisitely designed premium quality addons for Elementor Page Builder. The plugin comes with dark versions for the bundled addons. Premium version comes with sample data XML bundled to get a head start on the plugin by import of demo data on our site. Magnific Popup plugin integrated for fast and smooth lightbox support for posts/portfolio or image/video grid elements. Premium version include more customization options like icon font size, color, hover color etc. Choose from over 40+ custom animations for most addons (excludes sliders, carousels and grid). Customers of PRO version get access to a dedicated support forum with public/private tickets, searchable content and threads which are answered within 24 hours. The experience and expertize gained by providing support for over 11,000 customers for our paid themes is available to you. Private tickets let you work directly with our support staff by providing your site details. Essential addons include Services, Team, Testimonials, Clients, Pricing, Statistics, Tabs, Accordions, Carousels and Grid. Essential addons include Services, Team, Testimonials, Clients, Pricing, Statistics, Charts, Carousels and Posts/Portfolio Grid. Both Lite and Premium versions include dark versions for the bundled addons. Construct a responsive and filterable grid of posts or custom post types like portfolio entries. Multiple pages of posts/portfolio/image/video grid loaded inline without page refresh. Showcase your entire work anywhere on the site. The grid elements are loaded on demand with each press of a Load More button that displays a count of remaining posts. Responsive slider with choice of Nivo, Flex, Slick and Ultra Lightweight slider types. Comes with multiple caption styles, thumbnail navigation and detailed customization of slider speed and controls. Create a beautiful yet responsive gallery with support for tagging, linking, filtering, labels, lazy load of images with Load More and pagination. Essential tool for video bloggers, video marketers, musicians and other sites with video content. Tags, filters, external linking, labels, pagination and lazy load via AJAX supported. Advanced carousel with touch/swipe/drag/paged/click navigation. Extensive customization for responsiveness, animation/slideshow speed, gutter, looping etc. Perfect for showcasing a select collection of videos with filters, tags, external links, labels, touch/swipe/mouse drag/click navigation, paging and lightbox support. Display a list the product features or services offered in style. Exquisitely designed premium quality addons for Elementor Page Builder.. Along with the essential web building tools bundled with free version, the PRO version comes with additional advanced addons, functions and customizations detailed below. The PRO version comes with advanced grid functions like pagination, lazy load via AJAX, lightbox support etc. We follow best practices for plugin development. The current recommendations for the developers from Elementor team for building extensions/addons has been adhered to when developing these elements. Dedicated Forum – The customers will be provided access to a dedicated support forum. Public and Private Tickets – Private tickets help you work with us directly regarding the issues you are facing in your site by sharing the details of your site securely. Searchable Topics – The support forum is searchable for public topics helping you look for resolution of similar issues reported by other customers. Faster turnaround – The threads opened by paid customers will be attended to within 24 hours of opening a ticket. Bug fixes and Enhancements – Any fixes and enhancements made to the widgets will be prioritized to arrive quicker on the premium version. Proven Expertize – Having served over 12,280+ customers of our themes over past 3 years, the support provided by us is proven in competence and commitment. If you have queries regarding the product, feel free to get in touch with us.